Prune orchard surveys throughout the Sacramento Valley in 2016 and 2017 found significant presence of the wood decay fungus Phellinus tuberculosus. Phellinus causes decay in the heartwood of trees and often goes undetected until fruiting bodies appear (Figure 1) or branches break exposing the decay within (Figure 2). Broken limbs caused by Phellinus were found in orchards as young as 7 years, while every orchard older than 12 years had a high incidence of broken limbs and Phellinus infection. Phellinus is spread via spores released from the undersides of fruiting bodies, with pruning wounds serving as the initial sites of infection. 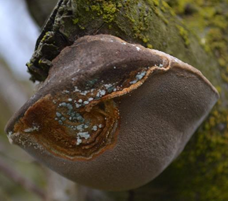 It is unknown exactly how long a pruning wound remains susceptible to Phellinus infection, but if inoculum is present and there is sufficient moisture, it may be years. Reductions in size and number of pruning wounds and pruning during dry weather may reduce incidence of Phellinus infection. Although Phellinus can be considered a major disease of prune trees, little research into its biology, epidemiology, and management strategies has been carried out. Our current project focuses on understanding the infection process and investigating possible prevention and control strategies to reduce the incidence and severity of Phellinus infections. (Left) Figure 1. Fruiting bodies of P. tuberculosus. (Right) Figure 2. Broken limb in young orchard caused by P. tuberculosus. ‘Improved French’ has been the dominant prune variety in California for the past century and currently represents approximately 95% of the acreage. This reliance on a single variety for such a long time has likely allowed Phellinus to adapt to decaying this specific variety. In collaboration with the UC Davis Prune Cultivar Development Program, we are evaluating new varieties for possible tolerance or resistance to Phellinus infection and decay. Preliminary results from laboratory wood decay studies show that Phellinus decayed significantly more ‘Improved French’ wood than most of the advanced selections from the breeding program. These experiments are currently being repeated and field trials are planned for 2019. On several instances during our survey work, Trichoderma spp. were isolated from Phellinus decay. Trichoderma spp. are often found colonizing Phellinus fruiting bodies (Figure 3). Trichoderma spp. are free-living fungi, antagonistic to other fungi, and are also myco-parasites, meaning they can compete with and consume other fungi. Trichoderma spp. have been shown to be effective bio-control agents and many commercial products are available for the control of soil-borne fungal pathogens. We are testing six commercially available bio-control products in the laboratory for their efficacy at preventing Phellinus decay and killing the pathogen. Our preliminary results indicate that pruning wound protection with Trichoderma-containing products might be effective at preventing Phellinus infection. However, field testing is needed before specific treatment guidelines can be developed. In February 2019, we will begin field trials to evaluate Trichoderma products as pruning wound protectants and determine their ability to infect and kill Phellinus fruiting bodies. Figure 3. Trichoderma sp. parasitizing P. turberculosus fruiting body. We are confident that through a combination of new varieties, bio-control products, and conscientious pruning practices, the impact of Phellinus on prune orchard productivity and longevity can be mitigated.